The main source of the 4-mile River Dour is at Watersend, Temple Ewell, while that of its tributary is at Drellingore in the Alkham Valley. Kearsney Court and Russell Gardens are on the tributary. An estate map shows that in 1774 there was a continuous stretch of water called Chilton Brook, from roughly where Bushy Ruff Lake is these days to where the road rises near Kearsney Abbey. In the 1820s, two adjoining mills were built on the site of an old mill at Bushy Ruff and it was these that created Bushy Ruff Lake. The Lake had the effect of drying out the land over which Chilton Brook had flooded, although occasionally it still flooded the area. To help combat this, a canal was dug along which the tributary flowed and across which a bridge was built. This enabled people, often with carts, to traverse from the village of Alkham and the Bushy Ruff mills towards Dover. Prior to this, in 1790 Peter Fector (1723-1814) of the banking family, purchased what was then the Kearsney Court estate, which included what is now Kearsney Manor and all the land westward along what became Alkham Valley Road to the Bushy Ruff estate. 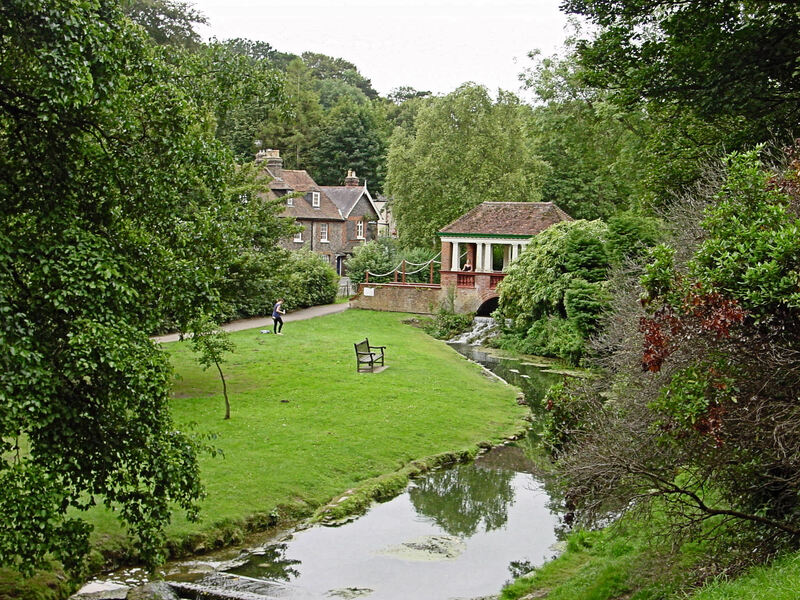 The purchase also included land from Temple Ewell to River. Thirty years later, following the Napoleonic Wars (1793-1815), his son, John Minet Fector (1754-1821), built Kearsney Abbey. Members of the Fector family, including his son, also called John Minet Fector (1812- 1868) remained at Kearsney Abbey until October 1844 when the whole estate was sold to E C Jones for £57,000. The estate was then bought by Ebenezer Fuller Maitland but on his death, in 1859, what was the 26acre Kearsney Court Farm, north of the Abbey and west of the Manor was sold. Alfred Charles Leney (1860-1973), the eldest son of brewer, bought the farm and a little more land, making 28.5 acres in all. He set about building a gentleman’s country home and the work was undertaken by Messrs Hayward and Paramor of London Road, Dover. The proposed mansion was to be of dressed stone and have, on the ground floor, a large hall, 3 reception rooms and a conservatory. The first floor would have 7 bedrooms, dressing rooms, bathrooms and in the basement would be offices. There was to be two servant bedrooms on the second floor, plus work rooms and the mansion was to be surrounded by modern style gardens. There would be stabling for four horses, a coach house, a coachman’s cottage with the remainder to become farmland. The approach was to be by a long drive with two elegant gate lodges and the estimated cost was £13,000. 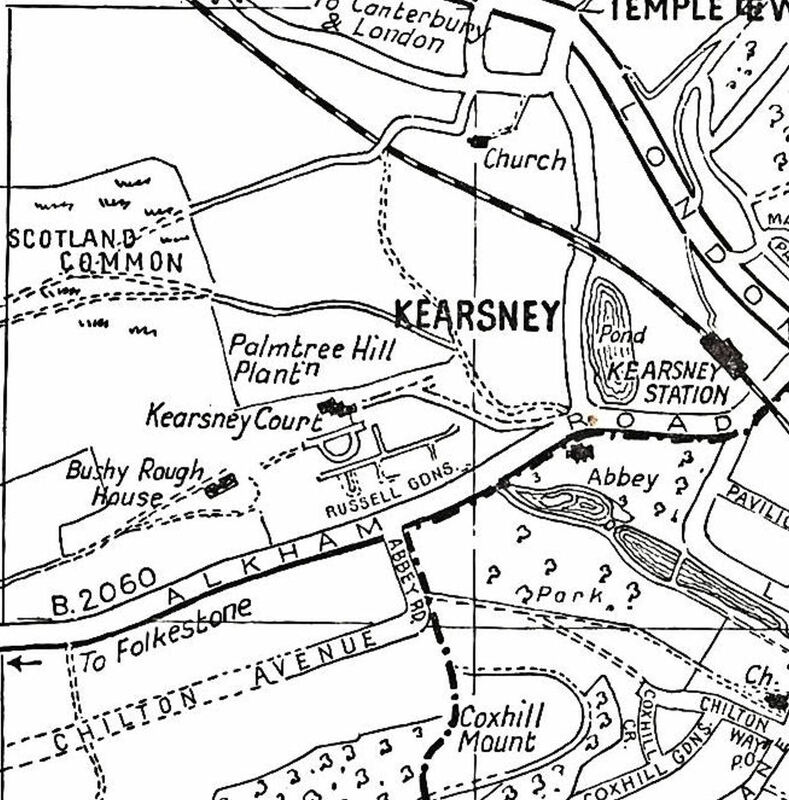 With the passage of time Kearsney Court, as Leney was to call his residence, became grander as he wanted it to be of greater importance than its neighbour, Kearsney Abbey! For whatever reason is unclear but about 1890, Leney decided to build his new home, called Garden House, at Sandling and sold Kearsney Court privately to Edward Percy Barlow (1855-1912). He was the Managing Directors of Wiggins, Teape, Carter and Barlow of London, a paper-manufacturing company that had recently purchased Buckland Paper Mill on Crabble Hill. Born in Hackney, Barlow had a successful career and was a part owner of the paper-manufacturing company. It had been agreed that Edward Barlow would run the new acquisition and consequently he was looking for a fine residence for his wife, Alice Mary, and growing family. They had two sons, Frank and Keith and two daughters Theodora and Barbara. Buckland Paper Mill could trace its origin to when a corn mill had stood on the site at the bottom of Crabble Hill, close by the River Dour. This was before Buckland Bridge, that crosses the river nearby was built. By 1777, paper was being made on the site and that year Ingram Horne (1785), a local landowner took over the mill. Having been rebuilt several times – on each occasion following devastating fires – and also having changed hands, in 1840 Charles Ashdown (1808-1888) bought the mill. He eventually went into partnership with Henry Hobday and in 1887 they won a lucrative contract with the giant paper manufacturer, Wiggins, Teape, Carter and Barlow of London, to produce Conqueror Paper. Unfortunately, on 25 September 1887, yet another disastrous fire badly damaged the premises but in order to fulfil the contract, they had the mill repaired and bought new state of the art equipment at a cost £7,000. Having successfully fulfilled the contract, Ashdown died and the giant company made Hobday an offer that he did not refuse! As one of the owners of the Company, Barlow became the Chairman of the Dover factory, taking up the post in 1900. While Barlow was in charge, the mill prospered and was subsequently enlarged. No2 paper machine installed and No 3 Paper Machine was introduced in 1911. 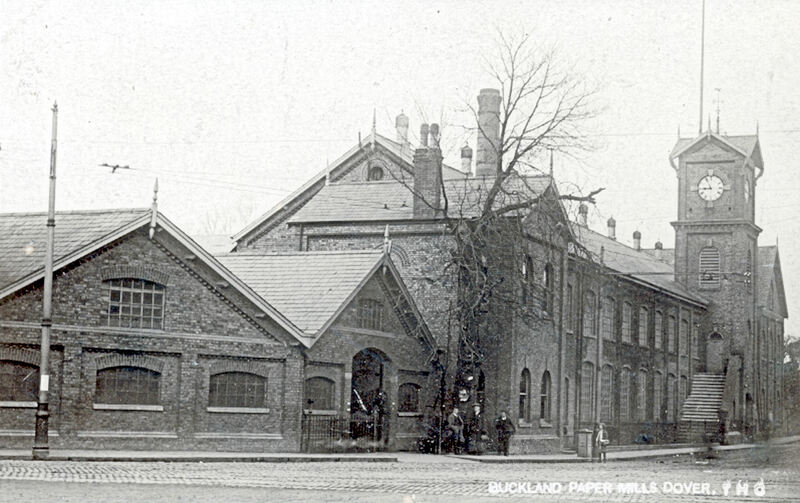 By that time, Buckland Paper Mill’s output was approximately 70-tons of paper a week and it was largest manufacturing firm in Dover. As a boss, Barlow was astute though popular with the workers. He was well known for providing support and assistance to his employees when they were in need and actively encouraged a Work’s Social club. In 1904, Wiggins Teape, as it was generally termed, under the direction of Barlow, took over Crabble paper mill and following a disastrous on 10 July 1906, had it rebuilt. The little mill opened the following year and the new building included a dining room and recreation room for the predominantly female workforce. This was in recognition of their attempts to control the fire. Of note, Alice Mary Barlow, became a leading member and in time President of the Dover Women’s’ Suffrage Society and their daughter-in-law, Alice, became the Vice President. Under the ownership of the Barlows, the red-bricked heavily gabled house was finished. To complement their magnificent home, Barlow hired Thomas H Mawson (1861-1933), the landscape architect of high repute, to create a garden that would show the house to its best advantage. Born in Lancashire, Mawson came to London to train as a gardener and quickly showed an aptitude for laying out gardens. At a time when local governments were endeavouring to cut unemployment by providing parks and gardens, Mawson became the landscape gardener of choice. Andrew Carnegie (1835-1919) spotted the young man’s talent and hired Mawson to prepare and execute a plan for Pittencrieff Park in Dunfermline. The successful outcome made Mawson’s name and eventually international fame. 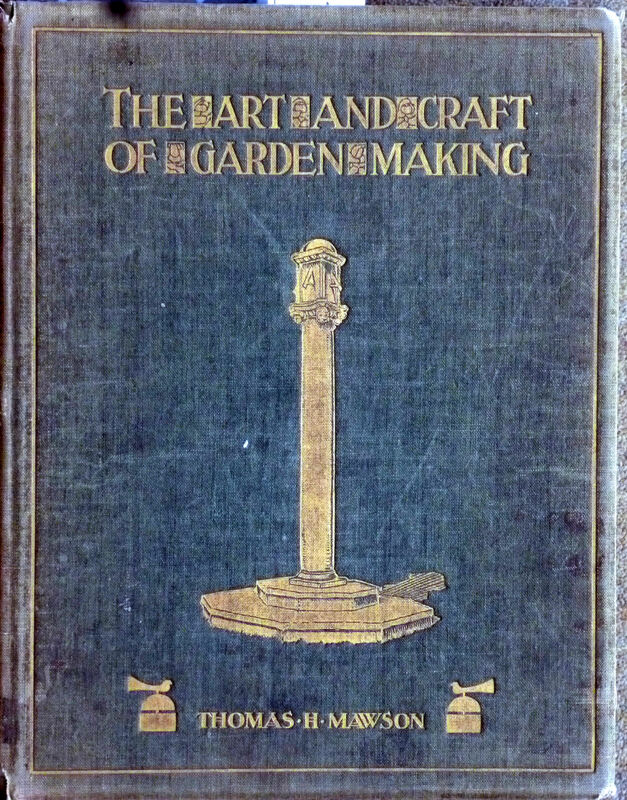 By the 1920s Mawson was also an acclaimed town planner his two main published works being The Art and Craft of Garden Making (1900), and Civic Art (1911), in which he discussed the principles of town planning. The basic premise of the gardens Mawson designed was to use the house as the focal point by the creation of steadily increasing informal layouts leading towards the surrounding countryside. At Kearsney Court, Mawson envisaged making a feature of the south facing side the house with a ‘cascading’ formal garden going down to the River Dour tributary. At the time the Dour tributary left Bushy Ruff in a southerly direction, first to Chilton Brook then easterly to Kearsney Abbey. 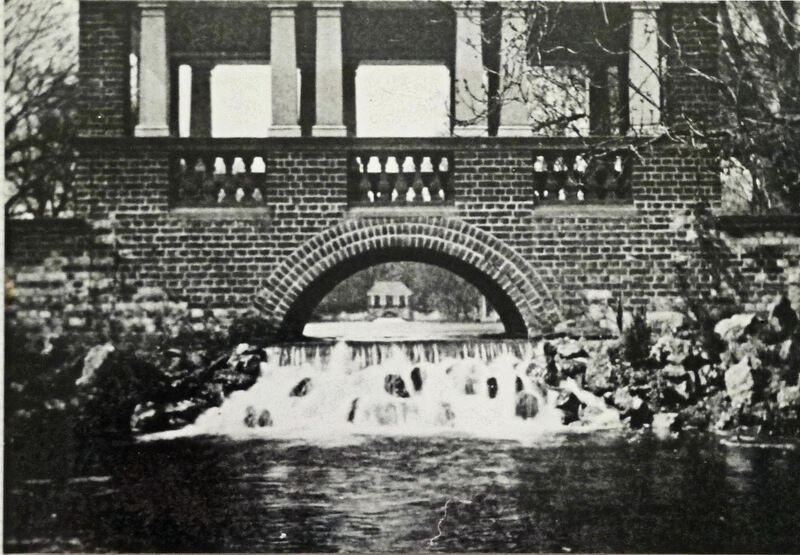 Mawson diverted a stream of the Dour, close to Bushy Ruff bridge, to pass along the front of Kearsney Court from west to east and then to be carried through a culvert across to Kearsney Abbey. The river stream was then designed to enter the garden over a stepped cascade, in order to avoid stagnation. This is almost under the eye catching Pergola Bridge, that can still be seen today, though at the time was next to a boathouse. From the Pergola Bridge, the river was then given the feel of a canal by an elongated lake complimented with the beautifully laid out walkways. A stream of water fed into a large lily pond situated to correspond with the centre of the house. Equidistant from the lily pond to the first Pergola bridge, a smaller Pergola Bridge was built under which the Dour stream cascaded into a less formal channel that meandered through the east part of the garden. The River stream then entered another culvert that took it across the Alkham Valley Road into Kearsney Abbey. On either side of the lily pond were tennis courts and there was also a croquet lawn. Going down from the house to the river, were raised semi-circular terraces with linking staircases and sweeping lawns, edged with box and golden yew hedges. The whole vista was interspersed with trees giving the impression of magnificence. Above the formal garden to the west the area was landscaped to give a ‘natural’ feel and included cedar trees and wild flower meadows. A few years after the completion of Kearsney Court gardens Edward Barlow became ill, so during the winter of 1911-1912 he and his wife went to the Mediterranean. Unfortunately, Barlow’s health did not improve. 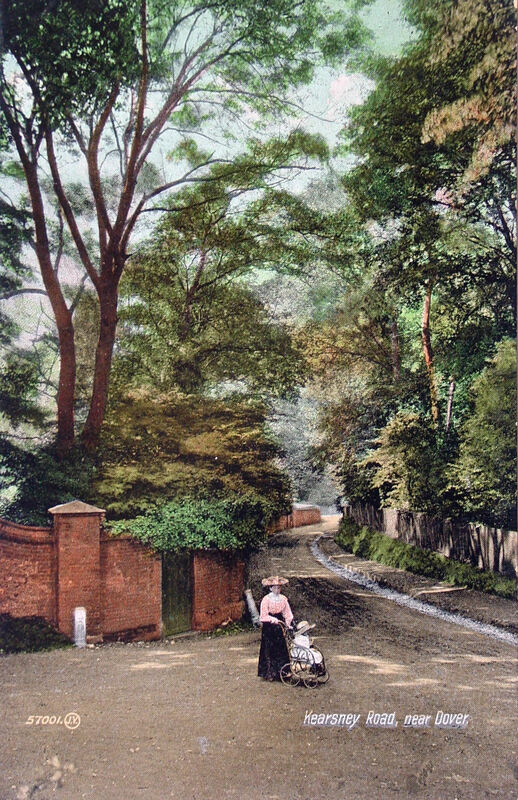 Returning to his beloved Kearsney Court, he died on Sunday evening 12 June 1912. Before Barlow became ill, besides running two mills in Dover and actively involved in the business of Wiggins Teape, he supported both local and county cricket teams and the work of the local Ambulance brigade. Barlow was a Magistrate of the Cinque Ports and as a keen yachtsman, the Vice-Commodore of the Royal Cinque Ports Yacht Club. 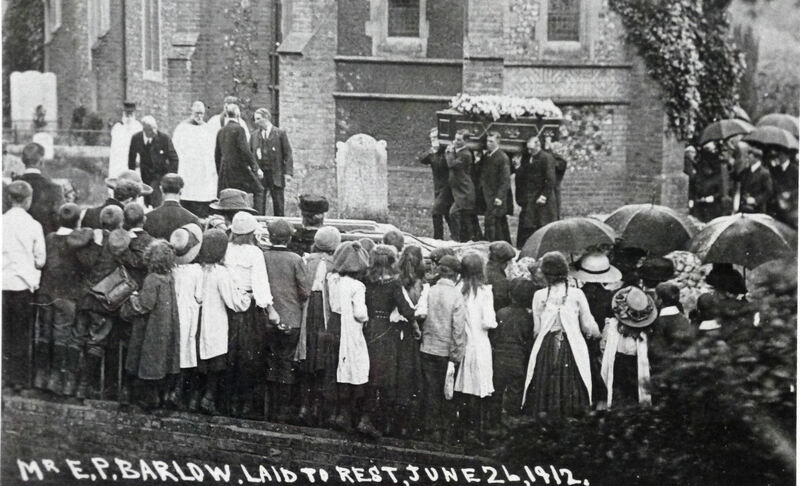 On the day of his funeral, all the flags on the principal public buildings in Dover were flown at half-mast and the service, which was packed, took place at SS Peter & Paul Church, River, where he was also buried. On the death of Edward Barlow, Kearsney Court was put on the market. The house was described as being approached by a long drive with three lodges and contained 15 bedrooms, four of which were fitted with baths. It had two staircases, a fine lounge hall, four reception rooms, billiard room, loggia, conservatory, a complete set of offices plus water and gas were laid on. The gardens were described as being terraced and included a croquet lawn and two tennis lawns, large ornamental lake, with streams, cascades and pergola bridges, orchard and grassland all set in about 22acres. 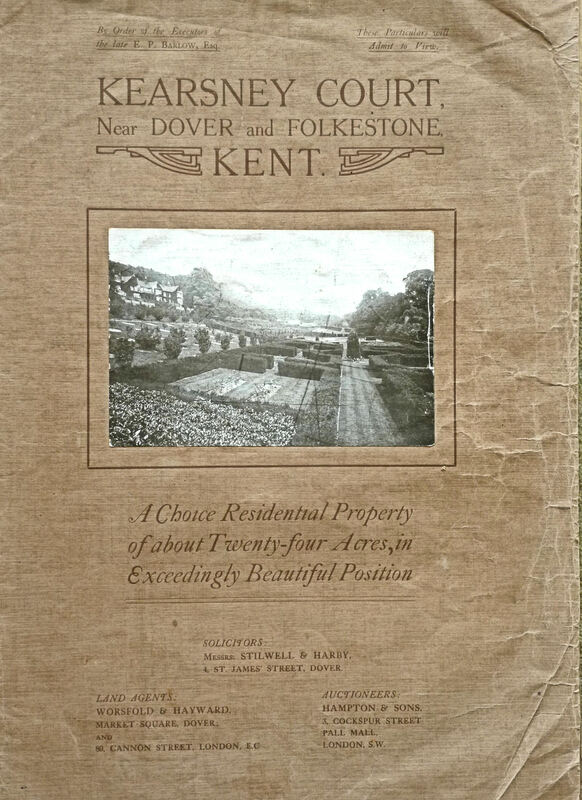 The property been put on the market by Keith Barlow (1885-1930) through Worsfold and Hayward of 3 Market Square, Dover. The solicitors were Stilwell and Harby. 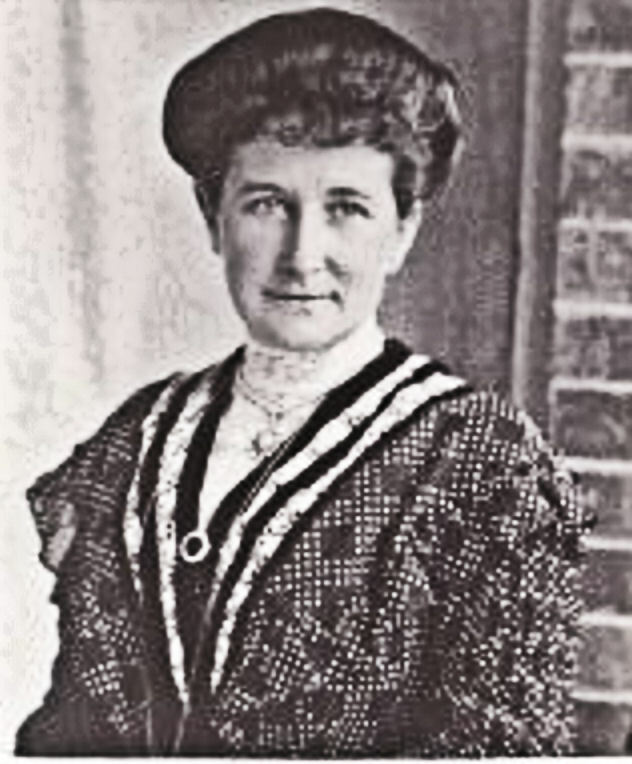 Mrs Alice Mary Barlow remained at Kearsney Court until the property was sold and then moved to Denton Court. Eventually, she moved to 15 Victoria Park where she died on 2 March 1930 and was buried next to her husband in SS Peter & Paul Churchyard, River. Their son Keith, on the death of his father, became the Chairman of Wiggins Teape’s operations in Dover and also a Director of the parent company. In 1925 he was appointed Chairman of the Wiggins Teape group of companies. In 1914, two years after the death of Edward Barlow, Kearsney Court had still not been sold, so the asking price was drastically reduced. Eventually, in 1915, Mrs E Johnson bought the property for £9,000 and following the end of World War I (1914-1918) she made the property over to her husband, William Johnson. It was on the market once again in 1925. The main attributes given were central heating, electric lights and main drainage, while the asking price had fallen to £3,500! Nonetheless, it was not until circa 1930 the property was eventually sold to Messrs A and H Stocker. They owned two private mental institutions in London and Kearsney Court became a hospital for wealthy alcoholics with Dr Frank Raymond King in charge. Following the outbreak of World War II (1939-1945) the mansion was requisitioned by the War Department and afterwards put on the market through Flashman’s of Dover. Courtney Dale Ltd, a development company, was interested in buying the mansion, with part of the formal gardens but not all of the land offered as part of the sale. At the time, there was talk of Kearsney Court becoming a temporary school while Castlemount school, in central Dover, was being repaired but this came to naught. Therefore, Courtney Dale’s offer was accepted and they bought the mansion, the upper part of the formal gardens, the driveway and part of the woodland to the west. The mansion they converted into seven maisonettes and the gardens were refurbished. Courtney Dale hoped to sell the woodland but it was in a neglected state and no one was interested. The remaining land, including the lower part of the derelict Mawson formal gardens stayed on Flashman’s books, unsold. Back in 1904 Hilton Ernest Russell opened a nursery in the village of River and showing an interest in local politics in November 1920 was elected to Dover Corporation. In 1928 he was elected Mayor and again the following year and his incumbency, which lasted from November 1928 to November 1930, was marked by several memorable events. In January 1929 he was in attendance at the council organised eighth annual dinner of Dover’s Klassical Konfraternity of Kongenial Konfrerers. This was a club for locals over the age of eighty years, of which there were 83 members in attendance and a further 800 who could not make the celebration. They received vouchers, which they could exchange for goods. In April, like all of Dover’s mayors since the end of World War I, excepting during World War II (1939-1945), he presided over the annual Zeebrugge celebration. On 26 June 1929, Mayor Russell welcomed the Prince of Wales (1894-1972), later King Edward VIII (1936), when he arrived at Dover Priory Station. The Prince, along with Mayor Russell and an entourage went to the Dover College playing field at Farthingloe, passing streets lined with local folk waving flags and cheering. At Farthingloe, the Prince inspected the 1st Battalion of the Seaforth Islanders, stationed at the Castle. Afterwards, they all went to the Citadel barracks, on Western Heights to watch the Seaforth Highlanders Games. Sir William Hillary Lifeboat built 1930 and brought to Dover to deal with aircraft casualties in the Channel. A month later, on 26 July 1929, to mark the 20th anniversary of Louis Blériot’s historic flight across the Channel on 25 July 1909, Mayor Russell welcomed the great aviator at Swingate Aerodrome. The party then went to Northfall Meadow to see the Blériot memorial commemorating the occasion that was paid for by Duckhams Oil. 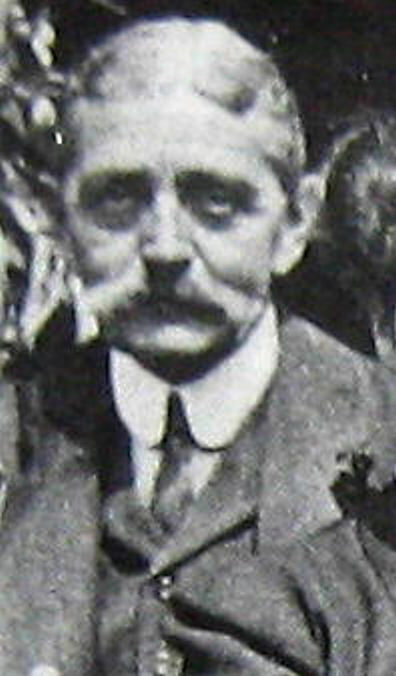 Alexander Duckham (1877-1945) was in attendance. Almost a year later on 10 July 1930, Prince Edward was again welcomed by Mayor Russell and this time it was the Prince who arrived by plane at Swingate. The Prince had come to the town to officially launch the Dover lifeboat, Sir William Hillary. 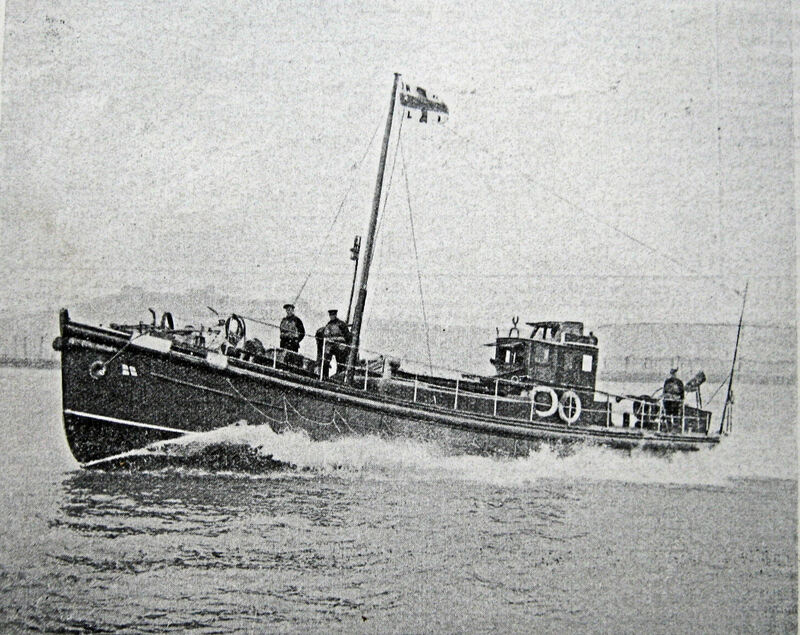 At the time, she was the fastest motor vessel in the world and had been bought to deal with the increasing number of aeroplanes crashing into the Channel. Alderman Hilton Russell was coming to the end of his tenure as Dover’s Mayor when one of the worst air crashes to that date occurred. This was on 5 October, during a storm over Beauvais in France, when the R 101 airship crashed. 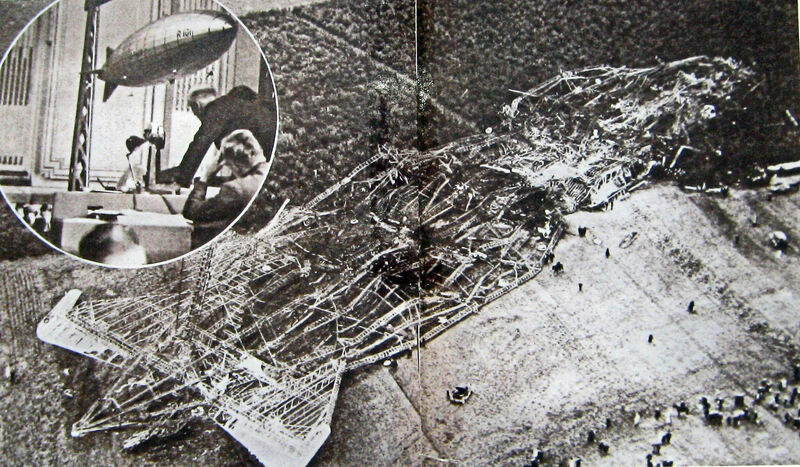 The airship had left Cardington, Bedfordshire on an experimental flight to India when she hit a hillside and exploded. Only six of the fifty-four passengers and crew survived. Amongst the dead was the British Secretary of State for Air (1929-1930), Christopher Thomson, 1st Baron Thomson (1875-1930) and the Director of Civil Aviation, Air Vice Marshall Sir Sefton Brancker (1877-1930). The bodies of the victims were brought back to England in the Royal Navy Ships Tribune and Tempest by way of Boulogne and Dover. On arrival at Admiralty Pier, there was a Guard of Honour with Mayor Russell in attendance before they were taken by train to London. With the consent of relatives, the bodies were buried in one grave at Cardington though memorial services were held elsewhere, including Dover. The Inquiry was conducted by John Allsebrook Simon, 1st Viscount Simon (1873-1954) with the resulting abandonment of all airship construction in Britain. Finally, in the hours before he ceased to be Mayor, Russell made the national press on his own behalf! It was November and one of the final points of discussion by the council was the opening of local cinemas on Sundays. The council had previously agreed that cinemas should close on the Sabbath but this had caused a public outcry so when the subject was debated for the second time in the Connaught Hall of Town Hall, now the Maison Dieu, it was packed. The debate was both stormy and passionate with much heckling against both sides of the argument. When it came to the vote, Mayor Russell was obliged to leave the Chamber so that if the result was hung he would not be influenced when he placed his casting vote. It was hung – 11 councillors for and 11 councillors against. The next decision was who would tell the Mayor to return to the Chamber to make the casting vote. In order to ensure that the Mayor was not influenced, the council took the extraordinary decision to send a telegram informing him of the result. This was written, the telegram was sent and everyone waited. Eventually, the telegram boy arrived with the result sealed in the official envelope. Nearly two hours had gone by when the council official knocked on the door of the room in which Mayor Russell had remained. The mayor, with due solemnity, was asked to return to the Chamber! 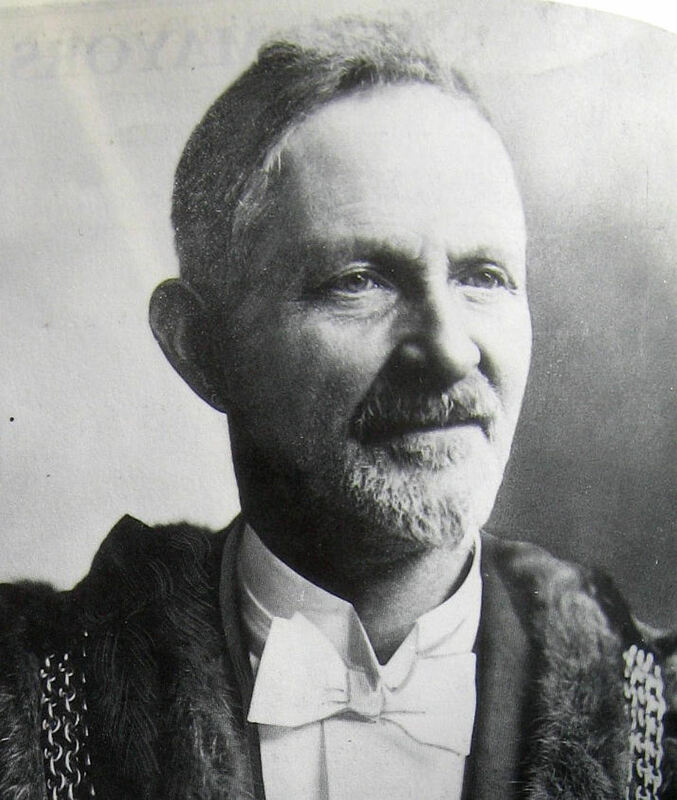 Mayor Russell stood in front of the assembled councillors, council officials, members of the public and of the media both local and by this time, from distant parts. With baited breath they all watched as he carefully opened the telegram envelope. He read the result, pulled himself up to his full height and announced to the ensembled throng that Dover cinemas would open on Sundays! During the next few years, Alderman Russell was created an Honorary Freeman, and appointed a magistrate. 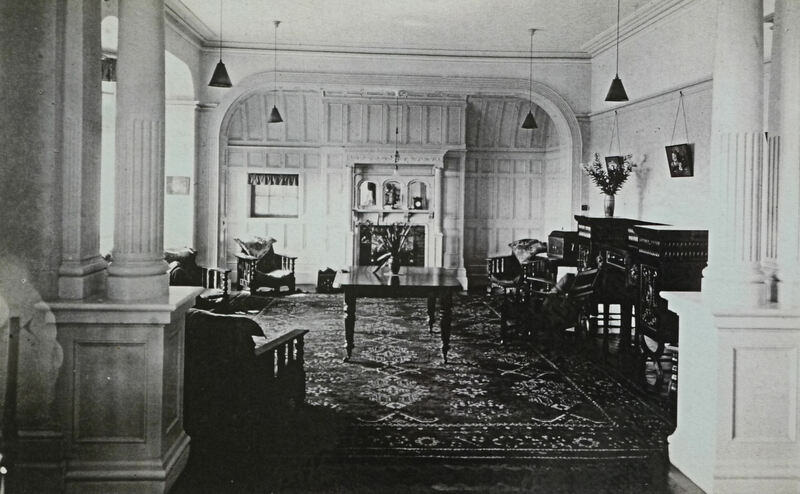 He was also instrumental in the council’s acquisition of Kearsney Abbey following World War II. 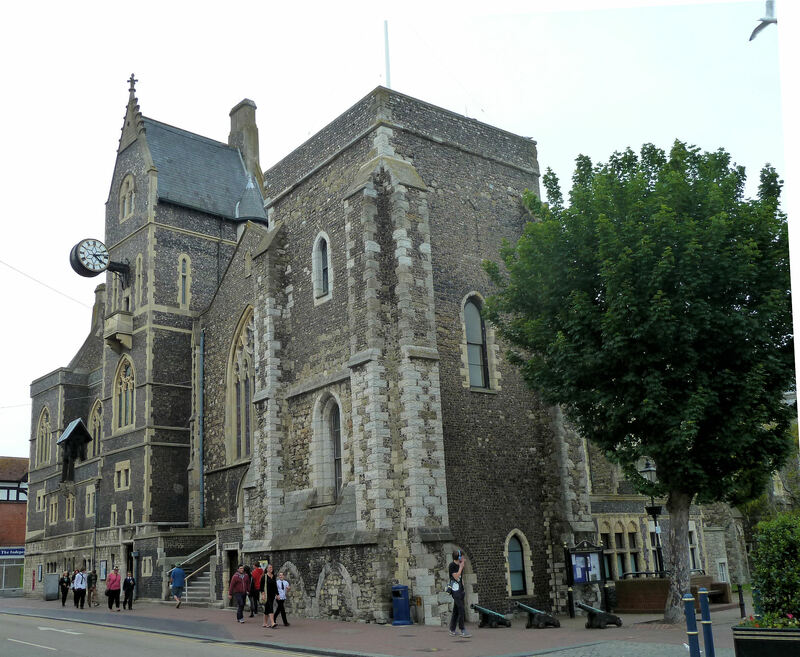 During the War the Abbey had been commandeered and after, Dover Borough Council (DBC) commissioned town planner, Professor Abercrombie (1879-1957) to draw up plans for war-torn Dover. He suggested that Kearsney Abbey and grounds should become a recreational focal point by creating ‘a pleasant riverside walk from the Sea Front to Kearsney Abbey.’ DBC dismissed the idea as ridiculous suggesting that the Abbey be demolished and the grounds used for housing but Councillor Russell endorsed Abercrombie’s suggestion and stuck to his guns. In the local elections of 1946, he made this an issue and lost his seat! A few days later the Dover Rural District Council (RDC) elections were held and Cllr. Russell was elected to represent Temple Ewell. Lack of money and material resources precluded the Kearsney Abbey being used for a housing development so the site was neglected. 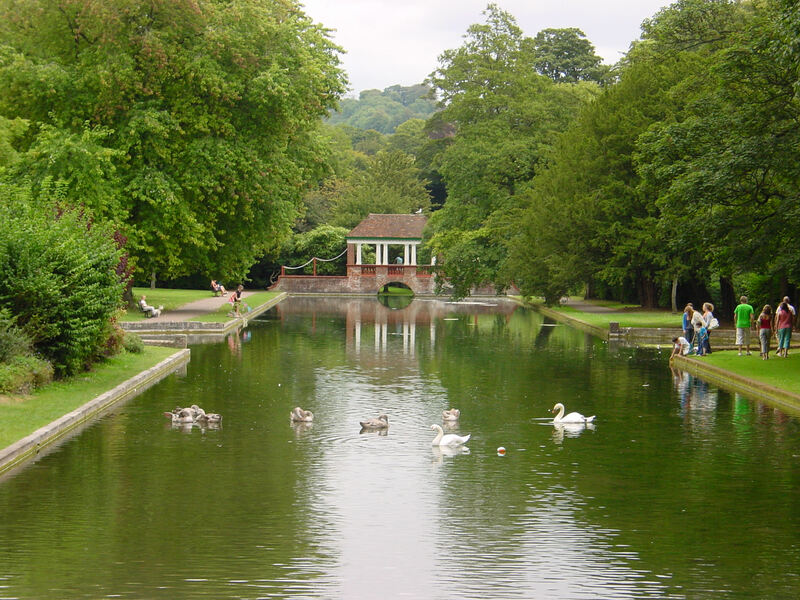 Although Kearsney Abbey was owned by DBC it was within RDC’s boundaries. When Cllr Russell was appointed to the RDC Pleasure Grounds Committee he put pressure on DBC to restore both the Abbey and the grounds. This DBC refused and instead successfully sort to change their boundaries to bring the Abbey and grounds within their jurisdiction. The full story of what happened next can be read in the Kearsney Abbey story, suffice to say that although Kearsney Abbey was demolished the grounds were saved for public use as Hilton Russell and Professor Abercrombie envisaged. As for the 23-acre Kearsney Court estate, following the conversion of the mansion into seven maisonettes, the development company, Courtney Dale Ltd, put the predominantly neglected woodland that was part of their purchase on the market. 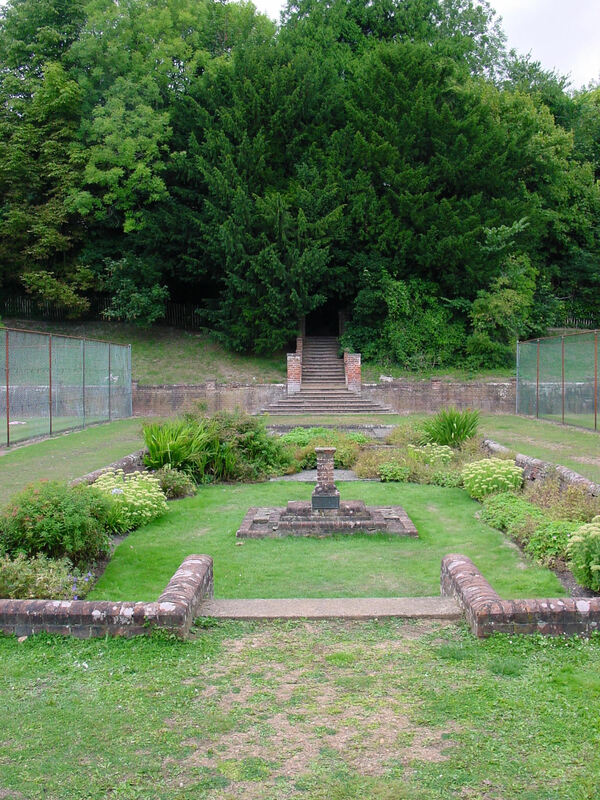 The part of the formal gardens that they had not bought remained on sale through Flashman’s of Dover. What happened next is not altogether clear, but it would appear that Cllr Russell, who had been appointed the chairman of the RDC’s Pleasure Grounds Committee, persuaded Courtney Dale to gift the woodland to RDC. At about the same time the company bought the remaining plot that fronted the Alkham Valley Road and included the lower part of the Mawson formal gardens. Cllr. Russell then set about persuading his colleagues on RDC to buy this plot from Courtney Dale Ltd. They offered £1,500, which was accepted! Once in the hands of RDC, Cllr. Russell, who was a gardener and nurseryman by profession, organised for the lower part of the Mawson formal gardens to be returned to something like their former state. Mrs C G Lines, wife of the Chairman of RDC, officially opened the renovated elongated lake, Pergola Bridges and sidewalks in May 1951. The remaining RDC owned Gardens were, over the next few years, restored when money and materials were available. Councillor Hilton Russell remained on the RDC until his death on 13 January 1959. He was buried near Edward and Alice Mary Barlow in SS Peter & Paul Churchyard, River by which time the Gardens were seen as a jewel in RDC’s and Dover’s crown and were named Russell Gardens after him! 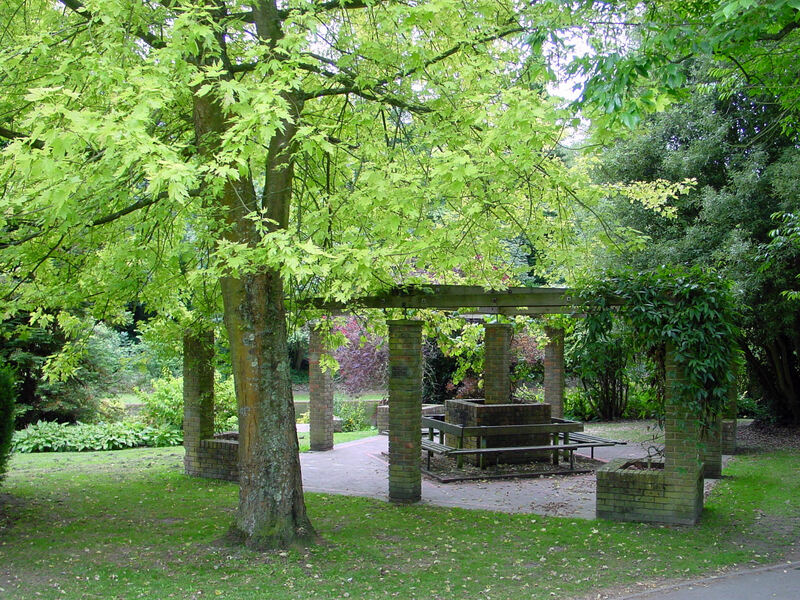 DDC made an application to the Heritage Lottery Fund’s ‘Parks for People’ programme for £3.3million to finance proposals to be carried out in both Kearsney Abbey and Russell Gardens. Regarding Russell Gardens, it is planned they will be restored, as far as possible, back to Thomas Mawson’s original plan. At the same time, recognising that Russell Gardens are a public park while Kearsney Court is in private ownership. Restoration will include removing overgrown shrubs to restore the visual connection between house and gardens, repairing paths and architectural features, improving entrances and planting, reinstating the summerhouse with public toilets, and creating historically sensitive play areas. It is hoped that the gardens will subsequently be maintained by a staff of three. This entry was posted in Barlow Edward - Kearsney Court and Russell Gardens, Kearsney Court and Russell Gardens, Kearsney Court and Russell Gardens, Open Spaces, People, Russell Hilton - Kearsney Court and Russell Gardens, Tourism. Bookmark the permalink.